Music for Maniacs: THE COMMIES ARE COMING! THE COMMIES ARE COMING! Ahhhhhhhhh... This hits the spot! Thanks Mr Fab, you've made my day! This crazy dude 'master minded' floating bibles via balloon into East Germany during the cold war. So weird, so clueless! 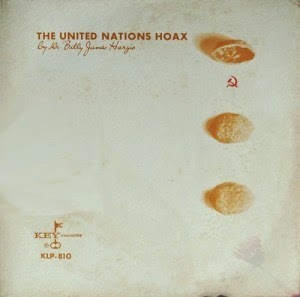 This was released on the John Birch Society label Key, in which every release climbed the charts with a bullet and every man was a star (the women stayed home, of course). Thank you, Mr. Fab, for this Key to the puzzle that is my life!